Town of Crested Butte, Colorado Says "No" to Ski Area's "Leap of Faith". The US Forest Service rejects the proposal because "it is not in the public interest". Third time in 30 years that significant support for keeping the mountain lift-free has emerged. Crested Butte Mountain Resort's operators, Triple Peaks, LLC, (also Okemo in Vermont and Mt Sunapee in New Hampshire), submitted a proposal to the US Forest Service seeking approval to expand lift-served skiing onto Snodgrass Mountain in the Gunnison National Forest. The corporation owns private land, which is approved for up to 1200 units and is adjacent to the public land on Snodgrass. This is the third time the Crested Butte community has dealt with this issue, and it's the third time significant community support has surfaced for keeping the mountain lift-free. A substantial portion of the Crested Butte community and its visitors value Snodgrass Mountain in its current lift-free condition for easily-accessed, deeply-loved, much-used, year-round, FREE, non-motorized recreation; an intact ecosystem; an elk migration corridor; wildflower meadows, healthy running streams and wetlands; economically valuable undeveloped open space; and a protective buffer for the internationally-renowned Rocky Mountain Biological Laboratory (RMBL), which conducts climate change research in Gothic, CO. The Snodgrass issue is about the use of public lands, a proposal to change that use, and who benefits and loses as a result of that change. Clearly, the real estate development corporation would realize a significant premium if their land could be developed as "ski-in/ski-out" properties. This premium has been estimated in the tens of millions of dollars. The ski company claims they need more intermediate terrain, yet the Master Development Plan submitted in 2009 identifies very little true intermediate terrain on Snodgrass. The Plan also reveals the need to alter the mountain in order to obtain intermediate terrain. Blasting, earthmoving, major alterations to hydrology, and tree removal would all be necessary. The ski company claims that more terrain would attract more skiers and improve the local economy. However, ski industry and Colorado Department of Revenue data show there is no correlation between expansions of ski terrain, increases in skier visits, and growth of ski town revenues. In fact, the ski area agrees that Colorado skier numbers are growing very slowly. The "leap of faith" Mueller is asking for is faith that terrain expansion would have a different outcome here, in this remote hard-to-get-to valley, than anywhere else in Colorado. In May 2008, the Crested Butte Town Council, after accepting public comment for two months, sent a letter to Forest Supervisor Charles Richmond, stating: "We find that too many of the people of the Town of Crested Butte.and many people in Gunnison County, do not want lift served skiing expanded onto Snodgrass Mountain. Therefore, the majority of the Town Council finds there is not enough community support for this project." 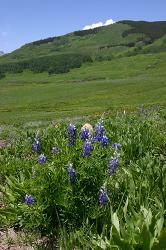 And, "We ask that the Forest Service help Crested Butte become an environmental leader. Help Crested Butte and the Gunnison National Forest become the place that everyone else tries to emulate.We feel this could be an opportunity for the Forest Service to be an inspiration and a leader by using public land for something other than private fiscal speculation by a few people." At the Town's public hearing, people overwhelmingly spoke in favor of keeping the mountain lift-free, empowering the council to send their strongly worded letter. In the numerous written comments received by the Town were statements by Friends of Snodgrass Mountain, Rocky Mountain Wild, and High Country Citizens' Alliance, all in support of keeping the mountain lift-free and continuing its current uses. Friends of Snodgrass Mountain presented a petition with over 1,400 signatures (67% Gunnison County residents, 14% Colorado visitors and 19% out-of-state and international visitors) that support a lift-free Snodgrass Mountain. Now, there are over 1,500 signatures on the petition. Rocky Mountain Wild's Ski Area Citizen's Coalition continues to give CBMR low scores on their "Ski Area Environmental Scorecard" each year, primarily due to their expansion plans. CBMR's purchase of wind power credits and new recycling program does not outweigh its plans to cut 200 acres of trees, drain wetlands, erect buildings, displace native and migrating wildlife, alter topography, consume water for snowmaking, and increase their energy footprint--all on a new mountain. The two chairmen of the Gunnison County Comprehensive Plan Economic Development committee recently withdrew their conditional support for lifts, citing climate change and water issues. The smaller Town of Mt Crested Butte, at the base of the ski area, sent a letter in support of lifts. Most respondents to the 2002 Gunnison County Community Survey placed ski area expansion 8th out of 8 when asked to rate issues of importance to the community. Letters on both sides of the issue have continued to pour into Charles Richmond's USFS office in Delta, Colorado. In June 2008 and again in March 2009, an executive team from the ski/development company conducted a public relations campaign, giving presentations throughout the Gunnison Valley. To the extent support exists in the community for a Snodgrass expansion, it is based on belief in CBMR's claims that a terrain expansion would increase skier days, improve the local economy, and add intermediate skiing. On March 23, 2009, Friends of Snodgrass Mountain wrote to Richmond, asking for a professionally-conducted Cost/Benefit Analysis of CBMR's stated Purpose and Need prior to the start of NEPA. The letter states: "The Cost/Benefit of terrain expansion on Snodgrass has been a primary source of disagreement about CBMR's proposal since 2003. The public's interest can be served only if the truth is established.If CBMR's claims cannot be substantiated, then you must make a reassessment of public support. The public's interest lies in determining the truth about proposals to change existing uses of the National Forest." On May 20, 2009 CBMR submitted a Master Development Plan. On June 18, 2009, CBMR submitted a "Proposal for the Development of Snodgrass." The Forest Service agreed to review both submittals concurrently. "First, I am not accepting your Master Development Plan which includes a proposal to develop Snodgrass Mountain for lift-served skiing. A revised MDP, excluding the proposed lift-served skiing on Snodgrass Mountain, will need to be submitted in accordance with the requirements of your permit. "Second, your site-specific proposal to build and operate lift-served ski facilities on Snodgrass Mountain is rejected. The reasons Forest Supervisor Richmond gave for the rejection included inconvenient public access to the Snodgrass ski slopes as well as "Limitations of Snodgrass Mountain for lift-served skiing development based on the numerous studies and environmental issues that have been identified over the years", including geological hazards, adverse impacts on Snodgrass¹ complex hydrology, the substantial earthmoving required to create ski slopes, avalanche dangers to Gothic Road users, the fact that "the community is deeply divided over the proposed development of Snodgrass Mountain", the displacement of current recreational users of the undeveloped Snodgrass, adverse impacts on nearby ranchers and on Rocky Mountain Biological Lab, and Roadless Rule conflicts. On February 3, 2010, the Town Council of Crested Butte approved a letter to be sent to Forest Supervisor Charlie Richmond about the current Snodgrass issue. The letter states that the current council has not taken a formal position on CBMR's Master Development Plan or its lift-served skiing development proposal. Click here to read the letter.